If you were looking for the best and complete via ferrata experience, stop serching, you already found it. 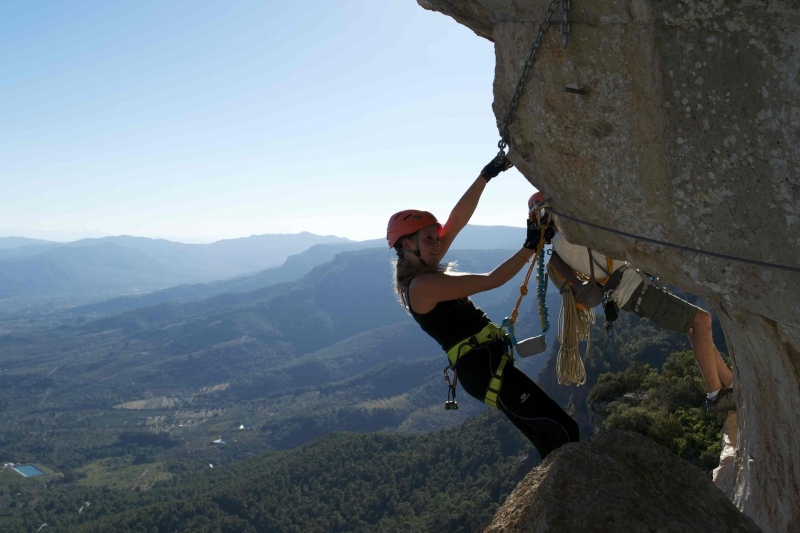 This vis ferrata is located on the magnificent Mussara range, from where we can enjoy the best views of Tarragona and all the Costa Daurada sealine, not far away, just a couple of miles from us. It has been recently stablished with the best materials and has four Nepalese bridges up to 28 meters long and a total route of 480 meters, including vertical sections, hanging bridges, terraces and stunning needles. It also offers a optional 20 meters abseil from the top of a natural totem. The location also allows us the best weather and temperatures all year long, thanks to the altitude of almost a thousand meters above sea level, and the orientaion. Certified instructor, technical gear, mandatory insurances and photo report. We’ll also learn: Technique and safety Ferrata skills, orientation, environment and tourism information.